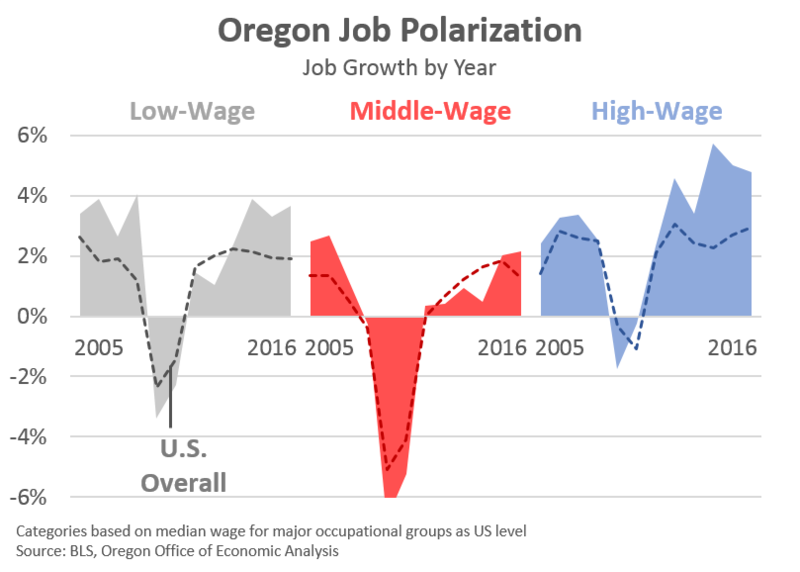 Last week we took a look at the newly released occupational data and job polarization across the U.S. Today is a relatively quick graphical update for Oregon and some of our regions across the state. At this point I don’t think there is a whole lot more to add in terms of the narrative. Please see last week’s post and our previous report for a more complete look. As such, I’ll get straight to the charts. The relative pattern of job growth being concentrated among both low- and high-wage occupations continued in 2016. Middle-wage jobs are growing again, but to date they are only about half-way back to where they were prior to the Great Recession. 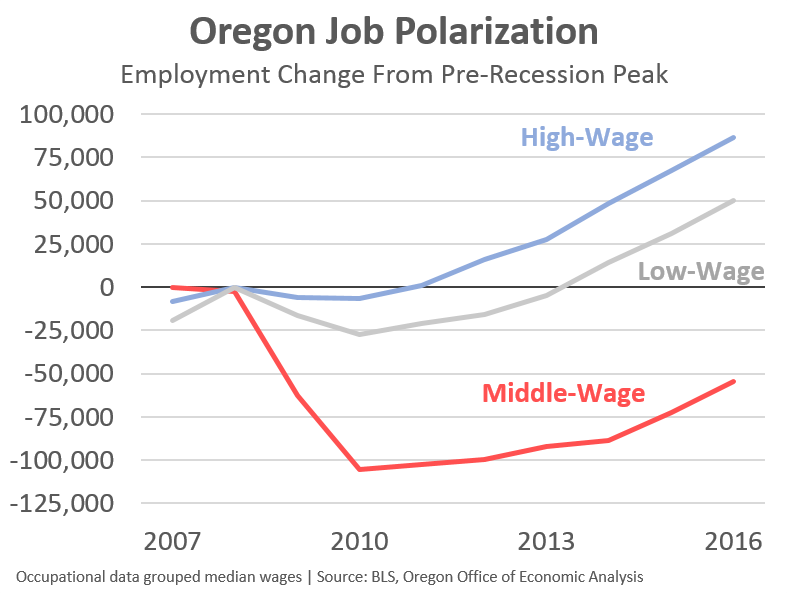 While middle-wage job growth slowed nationwide in 2016, that was not the case in Oregon where growth picked up slightly, which is encouraging. 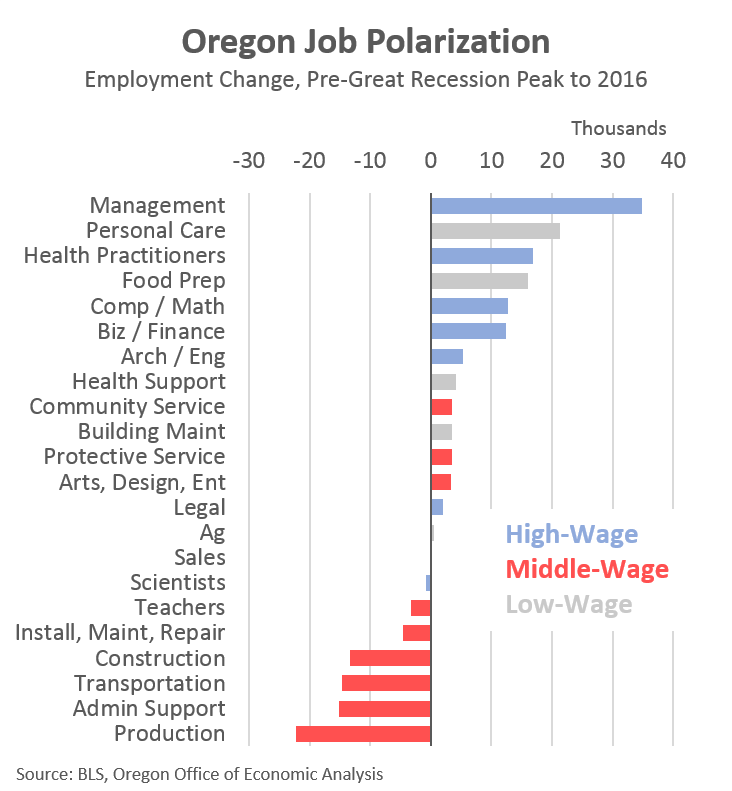 Overall Oregon’s job growth outpaces the typical state, as we always do in expansion, but we are seeing this across all three wage categories. Since our original report, there have been a few slight tweaks to the methodology we use. We are always looking to improve. It does not change the fundamental trends or outcomes, however we are working to refine our analysis. Below you can see each individual occupational group, how we classify it into the wage categories and its growth in recent years. You will notice that the occupational groups seeing the largest employment declines, and slower recoveries, are dominated by the various middle-wage jobs. You can also see why we talk about how polarization impacts both men and women here in Oregon. Technological investments often involve the automation of what may be termed routine work, allowing each individual worker to be more productive and allowing firms to get by with fewer workers. […] routine jobs have sufficiently well-defined tasks that can be satisfactorily completed by a computer program. […] examples include bookkeeping, clerical work and repetitive production tasks (manufacturing). […] use of modern software allows each bookkeeper to serve more clients than in the past. Similarly, for occupations where globalization is a contributing factor, routine jobs can be performed abroad by workers who are willing to accept lower wages and who possibly have less education or less experience. Relative to routine occupations, jobs that require abstract thinking and decision making and/or in-person interactions and communications are more difficult to replace. For example, the face-to-face interaction required for lower wage consumer service occupations (e.g. hairdressers, and childcare workers) make automation or offshoring of these services nearly impossible with current technology. Also, occupations that require specialized capital stocks or access to natural resources face less pressure than do routine occupations. 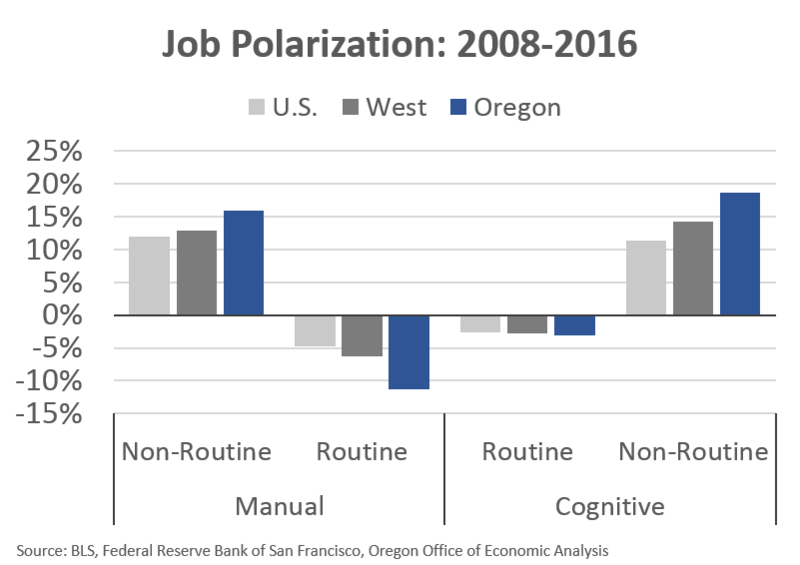 Lastly, we know the impact of polarization is not uniform across the state. Some areas are seeing stronger growth then others. High-wage job growth is strongest in our urban areas. That said, even in our rural areas the relative pattern of job growth fits the polarization story. 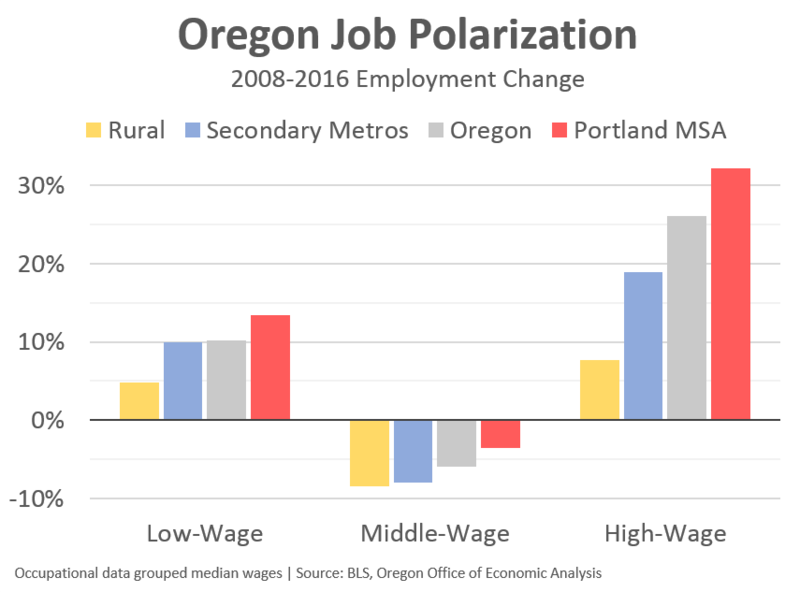 Rural high-wage jobs are leading the recovery for rural Oregon even if rural Oregon’s overall recovery has trailed urban Oregon. It helps me a lot to understand the report if you have me the ranges of each wage categories. So, what level of income is low, middle, or high? Interesting that Management has created more jobs than any other industry. Is Oregon a hub for corporate headquarters? As you point out, this is occupational data, so a manager of a grocery store or a manager of a high-tech firm are included here even if it is not a headquarter operation. That said, Oregon is not generally considered to be corporate headquarters state, at least when looking at the Fortune 500 or something similar. Do you know of anyone in Washington state doing this type of analysis? Hi Alan. I remember seeing an article a couple years ago that said a Seattle group had contracted with consultants to write a similar report to what we did for Oregon. I cannot find a link offhand. The good news, however, is that all the data you need is publicly available. Historical data from BLS and local projections from the Employment Department or state forecasts from the Forecast Council.